TwinStar Skip A Payment is back! To skip your next loan payment, log into TwinStar online banking, then click on “Services” and “Skip A Payment”. If you have loans that qualify, they will be identified here. Just make a few simple clicks to acknowledge that you would like to skip your next payment and off you go! There is a $35.00 processing fee for each skipped loan payment. You are limited to one skipped payment per loan during each calendar year. For example, if you skipped a car payment in January 2016, you will not be able to skip another payment until January 2017. 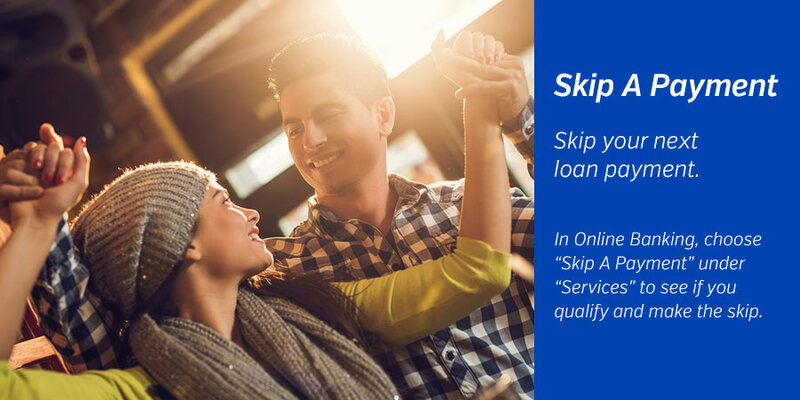 The Skip A Payment program applies only to fixed rate, fixed term loans like cars, RVs, boats, motorcycles, etc. Visa® credit card loans, ChoiceLine Home Equity loans and other open ended lines of credit are not eligible. Interest continues to accrue on your loan in the month of the skipped payment. Payments must be current and other conditions apply — check your eligibility next time you log in to manage your accounts. If you have questions chat with us online or call our Contact Center at 1.800.258.3115.